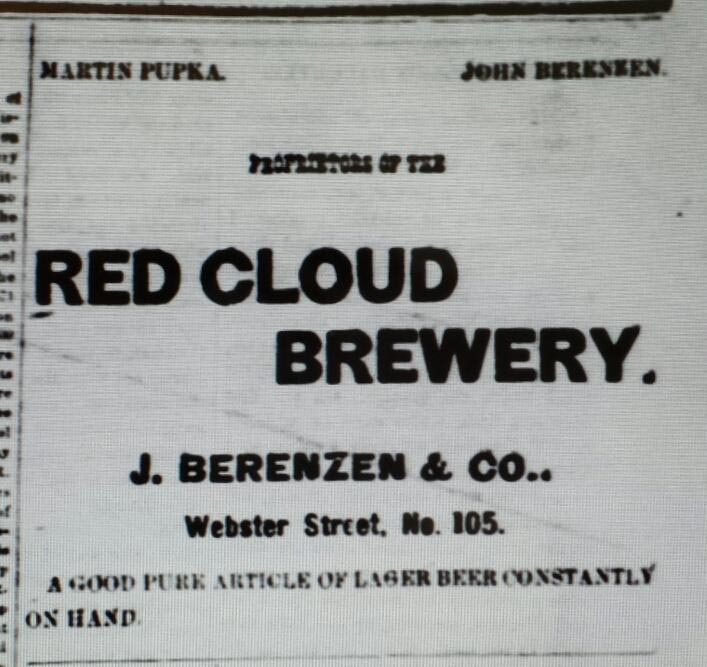 By 1875, earlier settlers, Martin Pupka and John Berenzen, decided to embark on a new adventure for the town – that of a brewery. Their first venture together appears to have been that of a two story stone building they erected on the northwest corner of Fifth Avenue and Webster Street. Constructed in 1873, it was used for their grocery business. At the time it was razed in 1914, it was most likely one of the oldest buildings from that era to still be in use. Its location was then used as the site for the new Farmers Mutual Telephone Building. A newspaper article reports that work on the brewery was progressing nicely – largely due to the faithful labors of three Bohemians, one white boy (whatever that meant), two American cattle, two Dutch mules, and one Frenchman. All were being bossed by Dutch John, and two carpenters who can’t be “bossed” by anyone. Before beginning production they advertised for barley warning if you wished to sell your barley to them you needed to ensure that none of the grains had been cut by a threshing machine. They cautioned that every grain needed to be as nearly perfect as if you were desiring it for choice seed grain. They went on to say that they would always be willing to pay a higher price, if such measures were followed. The crisp, fresh water of Crooked Creek served as their water source and they steamed up for the first time on Tuesday, July 15th. By October of that year, a commodious stable built by John Barber had been added to better accommodate the traveling public. The business address was listed as Webster Street 105 and appears to have been located one-fourth mile east of the railroad depot. It is shown on the 1892 Sanborn Fire Map but the site is not shown in 1897. Their enterprise operated under the name of Berenzen & Co. with both Berenzen and Pupka listed as proprietors.